It is wonderful to be back in church – I missed everyone last week. How many were here last week? Was it a good service? I chose the wrong week to be away – missed all the good food, hearing the incredible stories, catching up with people as we closed off our series of services celebrating our 13th anniversary as a church with the theme of #brightlights #shineforth. I want to thank each person who gave of their time and energy to make the last 4 weeks such a memorable experience and it is so heartening for me to hear how each person has grown being a part of this family and body of Christ. I had the opportunity to minister the Word at GSKL last week. As FCC is the only open and affirming church in Singapore, so it is with GSKL in Kuala Lumpur. I have been going once a month for the past 6 years to encourage them and teach the Word because they don’t have a full time pastor there at the moment. 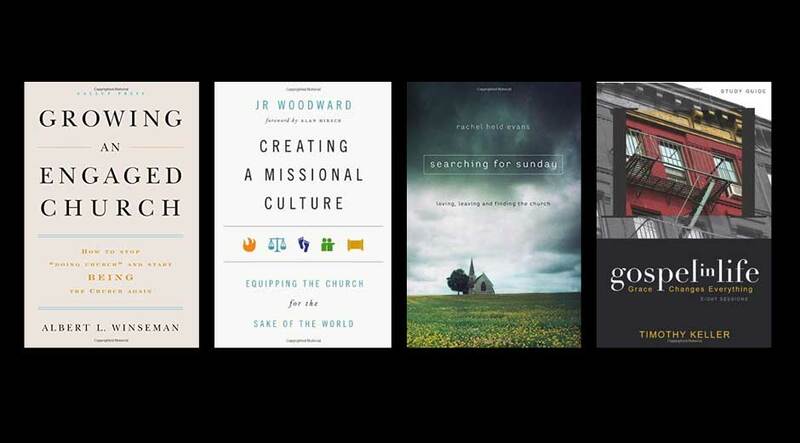 It has been amazing to see how God has been working in and through their lives and the development of the church. They are very tight knit community and very gracious – they continue to welcome me even though I can only preach in English as they are now are a Chinese-speaking congregation! During the anniversary service, we looked back at all God has done, remembering the milestones and the many miracles. It is so important to do that to remember God’s faithfulness. Just as the Jews have their festivals each year to remember all that God has done for them as a people as they come together to feast. As we will start our planning for 2017, this series is about preparing us to look forward into the coming year and start discerning what is going to be important for us as stewards of God’s mission and this church God has placed us in. Who here knows what is the mission of the church? If you have only started coming to FCC in the past year, you probably have made some conclusions on the mission of the church from the kind of activities we have, the way the services run (which I understand is a bit of a culture shock if you are new), and the way people relate to one another. But let’s take a step back for a moment – if you were here two months ago, you would remember that we explored the Bible together in the series “taking the Bible seriously”. And in that series Miak and Pauline shared with us that the overarching narrative of the Bible is the story of God – the story of creation, brokenness (separation / the fall), redemption, restoration. In the story of God, we find Israel’s story, and the stories of different characters in their stories. And through it, we find our story with these same narratives and themes. 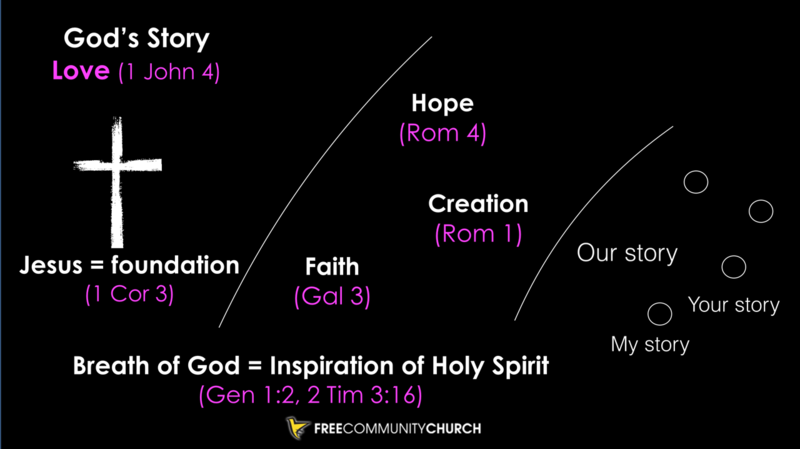 And when you approach the Bible from that starting point, we begin to see how we are connected to God’s story of love. This love is what makes the Christian faith unique – it is how we experience God – through Jesus. When you see Jesus, and see His life – you see the character of God and the mission of God. That God is love. A love that is unconditional; a love that is perfect; a love that is sacrificial. Everyone who loves has been born of God and knows God. 8 Whoever does not love does not know God, because God is love. 9 This is how God showed his love among us: He sent his one and only Son into the world that we might live through him. And the lens that is given to us about what God’s love looks like is through Jesus Christ – the Word of God made flesh. Jesus Himself says in Jn 14 – you want to know God is like, look at my life. And Jesus’ mission – why He has come – is connected to God’s mission – to reveal God’s love and to show you what is God’s will and way. This was Jesus’ central mission – to break in the Kingdom (or reign, or the ways) of God into the world and the call for people to repent (which simply means to stop and think about it, and head in the other direction). And set forth what it means to be saved – to become part of the kingdom God in following Christ. And in doing so we are participating in the mission of God – the redemption and restoration of all the world to Shalom – which is peace, harmony, wholeness, prosperity, the thriving abundant life for all. It says here to go and make disciples. Disciples are Christ-followers – following Jesus in what he taught, what he did, how he lived. The great commission instructs us teach one another – doing it in community with one another, to learn from one another. And that it connected to obeying – not just believing, but living it out the great commandment to love God and our neighbour as ourselves. So why we come together each week is not just about being a social club – there is a spiritual purpose that connects back to live out the Great Commission anchored on the Great Commandment. That requires us to change the way we live because our broken world operates so differently to the kingdom of God – the world we live in values people based on the size of our bank accounts, how we look, our job titles, instead in the image of the One who created us. But instead of living out of our identity as God’s beloved today, instead of living out as a child of the Creator of the universe, we live out of a not good enough, not being worthy; others are more worthy. As a result, we act out of fear and lack, instead of courage and generosity; we prioritize our comfort and convenience over service and surrender, and we become disconnected from following Jesus. One question I get asked a lot is what is God’s will for my life? It is right here – we worship God and do the will of God by living out God’s ways, instead of the world’s ways. When we are continually renewed to be more and more like Christ – when we are continually learning, changing and growing to be like Christ, we are doing God’s will. Is it God’s will for me to take this job? Is it God’s will for me to date this person? I don’t know and I don’t think that is that important to God – we can live out the will of God by following Jesus regardless of the job are in or the person we are with. We are called Christians – which literally means “little Christ”. So the simple litmus test if we are headed in the right direction is are we becoming more like Christ, or less like Christ? It means that as a result of believing the gospel, we need to live differently – Pauline taught us that “faith” is a continuous doing verb – we are continually called to learn and put in practice. They devoted themselves to the apostles’ teaching (they were continually learning) and to fellowship – they did it in community with one another. Earlier this year if you attend the series on Wholeheartedly, we learnt the importance to living authentically and how vulnerability is key our own growth and to building authentic relationships. There were many “wonders and signs” performed by the apostles. God was moving in their midst; there were miracles and things happening supernaturally. Now I want to spend some time to talk about this. Because many people believe that miracles stopped after the early church. Miracles are simply unnatural outcomes – you expect something to rationally happen one way, but instead it have another outcome that defies the natural progression. Sometimes it is hard to see a miracle when you are in the middle of it. For example, the Israelites were on their way to the promise land when they met challenges and started complaining. Why did you take us out of Egypt only to let us die here? There’s no water here, the Egyptians are chasing after us and all we have to eat every day is manna. As humans, we tend to focus on a point in time on the physical miracles. For example, the parting of the Red Sea. But the bigger miracle was the liberation of an entire nation – because Moses was willing to respond to the call of God and the people who were willing to give up what they had on a promise that God will be with them. And God performed the miracle through their obedience. When we think about the word “supernatural”, it simply means super (or above) the natural law. These are the laws that the universe operates by. For example, if you remember back to your school days, one of the natural laws is the second law of thermodynamics – which states that things moves from a state of order towards a state of disorder or chaos. So this pulpit over time will disintegrate and turn to dust, and not into an aeroplane. Similarly, if you don’t invest into a relationship, the relationship will also disintegrate as result of the separation – whether this is with another person or with God. And here we see instead see needs being met because of generosity, lives being connected together worshipping God, ministry happening to those who didn’t have enough. The church was the witness of Jesus, the hands and feet of Jesus and the hope of the world – and was enjoying the favour of all the people. The church in Acts was a growing community of Christ followers who were passionate about the message and the mission of Jesus, they practiced radical hospitality and radical generosity, and they were so engaged with the movement that they were willing to risk everything to see it succeed. One thing that I have recently learnt is that they were successful because of the engagement of their members. 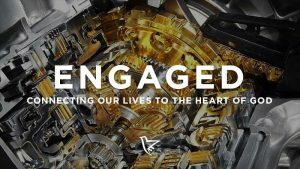 They were not focused on the size of their ministry – the growth was the outcome, but the keys were they were growing spiritually and everyone was all in – they were focused on engagement – everyone was learning; everyone were committed; everyone was engaged. The church at Laodicea was complacent and self-satisfied – and also spiritually impoverished. Its lukewarm Christianity was unpalatable, and its members had lost their passion – their fire – for following Jesus. They had stopped making disciples. In the words of Bishop Flunder, they had ceased to be a movement and instead had become a monument. FCC today is at an inflexion point; we are on the knife’s edge. So many passionate people on fire for God and the movement has built the church over the past 13 years. But the momentum is stopping. We are in danger of standing still. No longer becoming a movement, but a stationary, irrelevant institution called Laodicea more concerned about our comfort and convenience that living out our call. Over the past two years since we came to One Commonwealth, we have seen many people come and then leave the church. We conducted a survey to find out how people were satisfied with our services. You know, people were generally quite satisfied – but how many of you know you can show up once a month, put $2 in the offering, sleep through the sermon, and be extremely satisfied? We started noticing the weariness in people; but not just in others, myself included. Molly came up to me a few weeks ago and said to me, “you are losing your passion”. You know she can be very direct right? My reaction to her was, “hey I am just trying to listen to people and not impose my view”. But the deeper issue was called out by Pauline – the people I used to love working with were becoming more disengaged and it was impacting me too. When we digged a bit deeper, we saw why we were stopping. Leaders were not feeling supported, members were not growing spiritually, the Board was becoming busier and less engaged, people didn’t want to work together because of the hurt and pain they had experienced and they disengaged, and so, fewer people ended up doing more and then we started hitting capacity and burnout and people started taking sabbaticals, we started cancelling projects and not seeing through plans. Miak suggested one meeting a few months ago that it was time to call out a timeout; it was time for a reboot. We were in danger in becoming the church in Laodicea – an unhealthy, irrelevant, stationary monument. The church is the body of Christ. I am 42 this year, and I can look healthy on the outside, but I won’t know whether I am healthy or not until I go a health screening. I went for my first health screening when I hit 40 and I went through a number of different tests to make sure that everything was working fine. It is amazing what a bit of urine, stool and blood can tell you. One of the tests that I took was a blood test – and I was amazed at how much information a little blood can tell you that you cannot tell from just looking at my body from the outside. It could tell me if I had any diseases, whether my organs were functioning correctly, whether my immunity system was working well. There were a ton of measurements that were taken which was then measured against other people who were healthy to determine if I was healthy. Just as a blood test helps me measure if I was healthy (and I had a few areas that were not great that I needed to improve before the body breaks down), we too need to measure the spiritual health of the church. There is group called Gallup Research that fortunately does just this for churches. In the study that the Gallup Research organization did over the decades on healthy and unhealthy churches, they have found that it too was useless to look at the outside or outcomes to measure the health of the church. Measurements like life satisfaction, or giving amounts were not representative of the health of the church. 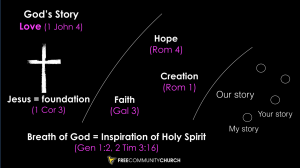 There were two main contributors to spiritual health – which are 1/ a commitment to spiritual growth and 2/ congregational engagement – the two elements which we saw the healthy early church Jerusalem focus on. We are all going to take this a blood test together in a moment. And even anecdotally, just comparing where we are between years, I know our numbers are not good because of what we can already see on the outside and because of the conversations we have had with people on the inside. Before the cancer spreads further, we are going to take a blood test, get our markers, find out how we stack against healthy churches and analyze the results as we start planning for 2017. If we are going to bring our body back to health, we need to focus on both spiritual growth and congregational engagement. We are going to take a 5-minute pause now for all of us to participate in this blood test. This is a simple anonymous standardized survey by the Gallup Research that I would all of us to take part in. Please take out your smartphone or use any browser to access this URL – https://aka.ms/pulse16q4. (If you are watching this video or reading the script after-the-fact, please also participate in this survey that will be open until 11 Nov 2016). Thank you for your participation. We look forward to sharing the results with the church and get to the insights so that we can focus our priorities in 2017. It is clear that the early church in Jerusalem was a very engaged church, but what does it mean to grow spiritually? This is the other element in spiritually healthy churches. At our recent leadership retreat, Pauline proposed an initial model for spiritual growth – how we are going work on growing together. It is very easy to remember and you will become very familiar with this picture over the next few months as we build it out together so that we can restart our engines as a church and start moving again. 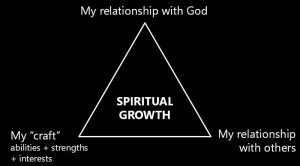 There are several parts to how we understand spiritual growth. It is not just one dimensional, and certainly not about how much of the Bible that you can memorize. Let me quickly take you through a summary of the approach as we close our time together starting with the corners of the triangle. 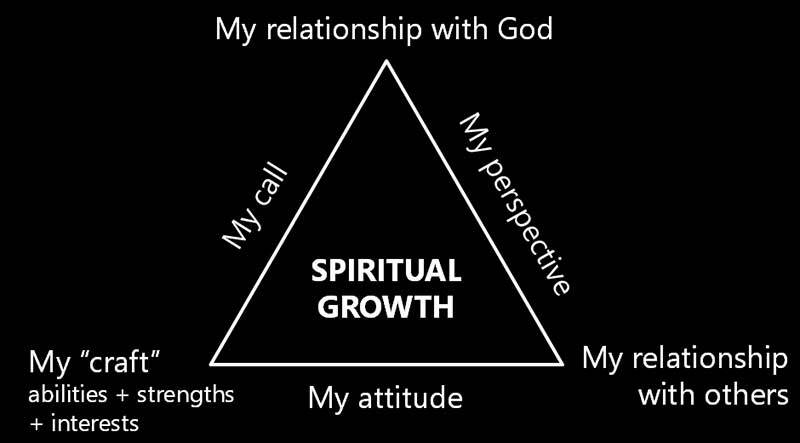 At the top of the triangle – this is our vertical relationship with God. We are first and foremost called to love God with all of our heart, mind, soul and strength. We are also called to redeem the image of God within each one of us, to heal ourselves from the broken image we have, to clear up the mirror that reflects who we are – that our identity and worth is based on the image of the One whose likeness we are created in. At the bottom right corner – is our relationships with others. We are called to love one another in the same way as God has loved us. We are called to grow in community with one another; during his ministry on earth Jesus did life together with his disciples, so too we are called to grow in community with each other. Ministry is a team effort and requires us to work with one another. During Jesus’ ministry, there was always a crowd following Him. The crowd wanted provision, healing, assurance, protection, blessing. Nothing wrong with that. But the ones that experienced growth and transformation were the smaller group of twelve disciples who committed to community with Jesus and with one another. The disciples were the ones who experienced the transformation because it is in community that we grow. At the bottom left corner is what we are calling our “craft”. You and I are created uniquely, with our personalities that give us our strengths (and limitations), together the gifts, talents and abilities that God has already put inside each one of us in seed form, and as we grow these seeds are shaped by our experiences to become our interests. And it is going to be different for each person. For Christa, it is her love for children. For Zihao, it is his love for music. For Miak, it is his passion for social justice. These three points are connected together as a triangle. So let’s start with our craft. When we connect our craft with our relationship with God to meet a need, it becomes our call. There is no one job or role more important in the body of Christ. Your uniqueness is what makes the body more complete; you are called to do things that others are not called to do, and when you connect the unique talents and strengths that God has given you to serve and minister to another person, you are operating in your call and you are connected to the mission of God. If someone has to do someone they were not created to do, or not interested in doing, guess what? They won’t enjoy it, they would not be good at it; it will not be sustainable, and people just end up feeling out of place. But when you are in your call, it is what you live and love to do – you are thriving because you are doing what you are created to do. I know for members of the AV team, they thrive when they are creating a conducive environment so that we can connect our hearts with the heart of God through the different elements of the service that they enable through sound, audio, video, and multimedia. Their craft becomes their call when they are able to share our Sunday services to thousands who visit our website each week. That brings us next to the next connection; how we connect our craft to others is our attitude. Each of us does not just have the responsibility to release our gifts that have been given to us, we are called to create an environment where there is good soil for others to flourish as we work together. We are called to remove the rocks of skepticism, and to make the soil deep and rich through our deep relationships so that roots can go down deep and withstand the most difficult times. We are called to also soften the hard ground with encouragement, appreciation and affirmation so that each person can grow and flourish in their gift in the ministry in church. How many know that doing ministry in FCC can be very hard ground? The final connection is between our relationship with God and others. When we see others in the way that God sees them, we grow in our perspectives. When we are connected to God’s mission, we work with God to redeem and restore the image of God in other people. We recognize that when you see a person, no matter what the person looks like on the outside, no matter how the world values the worth of that person, we see the image of God on the inside – that the person is created with infinite worth, that the person is equally beloved by God, but at the same time, equally broken as you are and in need of love and grace. This perspective gives us the ability to give up the right to being right – to forgive and restore relationships – to lean in to discomfort when things get rough, and not run away. It gets easier to do this when we learn and the practice and then learn and practice. Zihao has reminded me that practice doesn’t make perfect; practice makes the permanent the change at we want to see. For some time, our church has ceased being a movement of God. We have been focusing on affirmation – people come in and we have focused on helping people know that they are loved exactly the way they are and what God’s love and grace is like. It’s like coming to a spa. It is very affirming, very refreshing, very soothing. But if you are unhealthy, a spa doesn’t help you. You need to get into the gym. 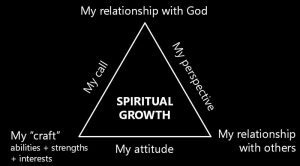 You need to start growing spiritually and we have not been focused on that. 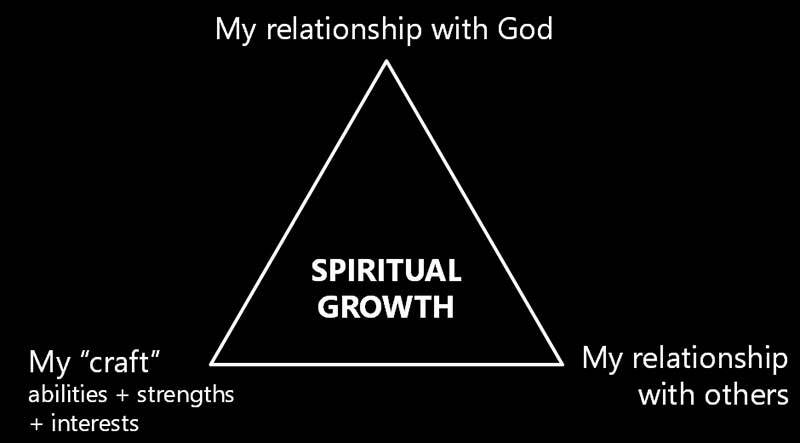 We need to work at our spiritual growth. Phil 2:12-13 tells us that we need to work out our salvation. Salvation is not just a one-time decision, it is a continual commitment towards growing and changing. God loves us exactly the way we are, but loves us and the world too much too much to leave us the way we are. So in the coming year, we are going to focus on our spiritual growth; we are going to strengthen our engagement so that we are all in this together and restart our engines as one body to start moving again. Are you ready? 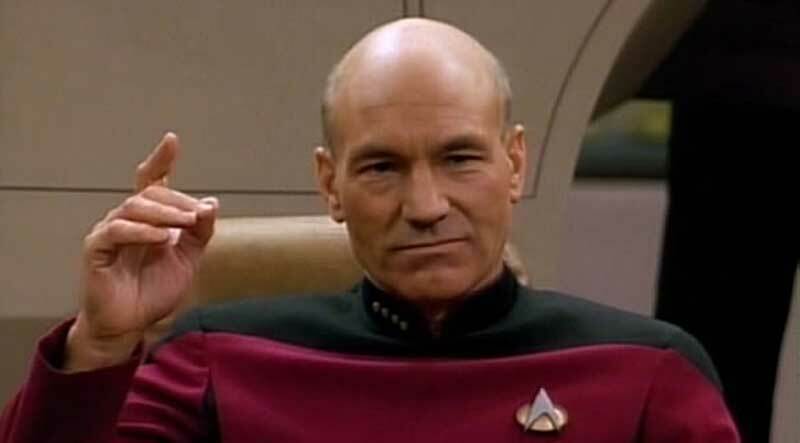 In the words of my favourite Starfleet captains of our time, set thrusters to full power, and engage! Let us pray. Dear God we thank You for Your presence in our lives. Thank You for revealing to us Your heart for each person – that we are Your beloved child made in Your image. Thank You for this church and Your faithfulness for the past 13 years and for the miracles that has sustained us and brought us to this moment. You have called us to come together to be Your church – Your body. To be a witness of Your love and the hope of the world as Your hands and feet. You have called our story to be connected to Your story. And God this morning we pause and think about where we are heading – whether we have been heading in the right direction as Your followers, or if we have been content standing still, and stopped growing spiritually, and become disengaged and content. We ask you to convict us and help us to focus on the areas of our lives and the life of this church that are unhealthy. I pray that each one of us with allow the Spirit to move within us to help us restart our growth and become a move of God again in the coming years. We thank You for all You have done, and all that You continue to do in and through our lives to reflect the light you have given us into the world. In the name of Jesus we make this prayer, amen.